Scott Hargrave had every right to assume he was the victim of a prank call. In 2015 the Canberran concreter-turned-brewer found himself on the end of the line with a proposition far too outlandish to be true: to move to the Gold Coast to join a bunch of pro-surfers in setting up the nation’s soon-to-be favourite craft brewery. The boys are the seven founders of Balter (balter.com.au) – including surfing identities Mick Fanning and Joel Parkinson – but this was to be no merchandise cash-in. 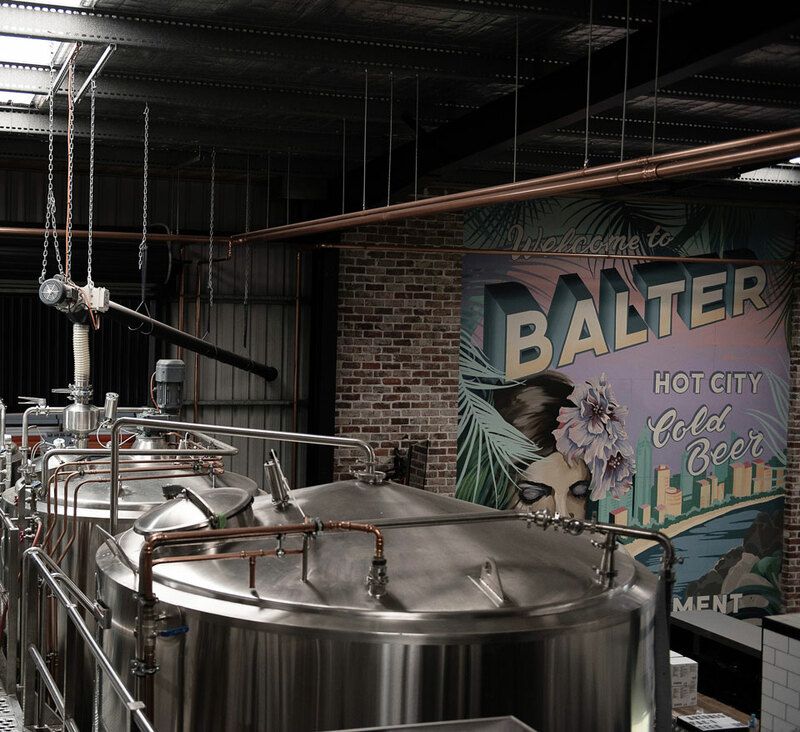 With its minimalist aesthetic, the Balter team had a beer that would propel it from the streets of Currumbin and into the thirsty collective hands of an entire nation, taking out GABS Hottest 100 Aussie Craft Beers two years running in 2017 and ’18. The XPA proved to be what Australia was waiting for, and Balter’s eureka moment: a modest 5% ABV and 30 IBU, it’s charming with exotic tropical hop aromas and lush pale malts, with a clean but fragrant finish that is both refreshing and revitalising. From the beginning Balter stood for something so glaringly obvious it was easy to miss: approachability. While hardly saucy marketing speak, ‘approachable’ is a word you’ll hear throughout the breweries popping up along this length of iconic coastline. Black Hops embodies the spirit of the Gold Coast: a welcome but unfussy tap room with a roller door, tin shutters, a mixed crowd of post-work drinkers, craft beer acolytes and staff languidly strolling about in thongs and singlets. But while the mood may be decisively relaxed there is no misreading the brewery’s bold ambition. A second much larger production facility is on the way plus there’s a high-profile crowd-funding campaign and the spectre of Big Beer ever circling. Burleigh Brewing (burleighbrewing.com.au) set the template for all Gold Coast breweries that followed: supreme quality, zero fuss. The range of lagers, pilsners and pale ales proved to be regional beacons – fashioning beers that respond to the conditions of the region but never compromise on quality. There’s a lush village-like idyll on the Gold Coast that feels a world away from the glassy sheen of Surfers Paradise. And it’s here you’ll also find Fortitude Brewing (fortitudebrewing.com.au), an oasis of refreshing beers, legendary for its flavoursome mid-strength pale ale, Pacer, and the rockmelon-scented Summer ale. Lost Palms Brewing Co. (lostpalms.com.au) in Miami may be the newest grommet on the beach, but this modest-sized operation epitomises the irreverent-yet-ambitious moxie of the region. With a cheeky nod to the ’80s aesthetic of Miami Vice – replete with lustrous pink can-art – there is nothing droll about the beers: a selection of finely-crafted blondes, pales and IPAs that never push beyond 5.5% ABV. “This is not Portland, it’s the Gold Coast,” co-owner Scott Triana says. “It’s cheeky, it’s playful, it’s hot and it’s thirsty.” Australia, it’s time we talked about the weather.